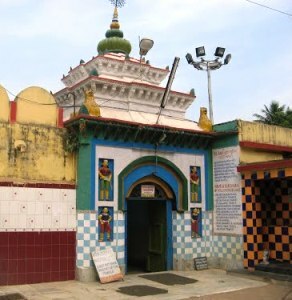 The Khira Chora Gopinatha temple is situated in Remuna.It is a little town located 9kms east of Balasore,about halfway between Calcutta and Puri.The name "Ramuna" is resulting from the word "Ramaniya" which means very good looking.It is supposed that Sri Rama carved 'Gopinath'with His arrow and that sita worshiped this deity in Chitrakuta. King Langula Narashingha Dev,the king of odisha,brought this Deity to Remuna in the 13th century from Chitrakut.This king also arranged to have dug the two bigthanks,'Brajapokhari'and'Kutapokhari' Sir Gopinatha is the Deity who stole sweet-rice for 'Mahavendra Puri'.Being worshioped on the alter with Sri Gopinatha are Sri 'Madana Mohana',Sri'Govinda','Radha-Rasabihari',and'Chaitanya Mahaprabhu'with Lord'Jaganntha'on one side and numerous'Shalas'on the other side. Lord Gopinatha,flanked by Sri Govinda and Sri Madana Mohan,is made of black stone.Sri Gopinatha stands in bas-relief.Govinda and Madan Mohan,who wewr brougt from Vrindabana in about 1938 by a devotee named "Chaitanya Dasa Babaji",are free standing. One can get delicious'Khira'here call'Amrita-Keli'.The Gopinatha Kshira is a preparation of condensed milk,sugar,and cream,with a sprinkling of raisins.It comes in pots of various sizes,which are personally tasted by Lord Gopinatha himself.Sri Gopinatha is Known as "khira Chora Gopinatha"because he stole and hid a pot of 'Khira' out of love for Madhavendra Puri. 'Chora'means thief.